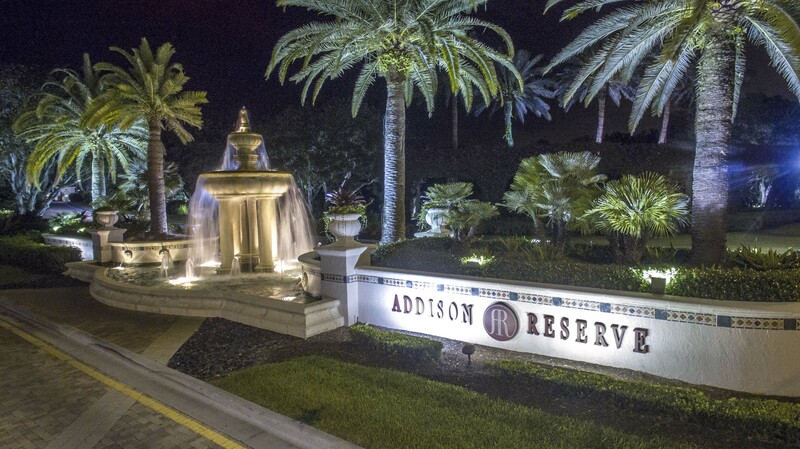 Addison Reserve is an active Country Club Community located on the West side of Jog Road north of Clint Moore Road in Delray Beach, Florida. Addison Reserve features twenty-seven holes of Arthur Hills-designed championship golf including rolling hills and valleys, and lakes paralleling fairways. Complementing the championship golf is the grand Clubhouse, with formal and casual dining and entertaining facilities, and The Esplanade sports center featuring amenities one would expect to find in a first-class community, including 13 tennis courts, Mediterranean-inspired swimming pool, exercise and aerobic rooms, and indoor-outdoor casual grill, massage, whirlpool and steam rooms, and a children's activity center complete with computer. True to upscale Country Club living, Addison Reserve offers golfing, playing, dining and relaxation. If any of those four appeal to you, then shopping for a home in Addison Reserve is a good place to start. Memberships are available for Golf, Sports (fitness, tennis) and Social, so whatever your interest, you can find it here. If you love to play golf or would like to learn, take advantage of an onsite golf pro with private instructional classes. Enhance your wardrobe at the pro shop and immerse yourself in the natural beauty of the course. Do you enjoy tennis? From children's tennis clinics to working and playing against the top-tier tennis enthusiast, Addison Reserve has a game ready for you. Although Boca Raton has some of the best restaurants in South Florida, you also have access to 5-star cuisine right outside of your front door at Addison Reserve. Italian, tapas, drinks and a "to-go" menu so you're totally covered at Addison Reserve. Relax in the Zen-inspired spa and fitness center to help your mind and body be at peace. When it comes to selecting your home in Addison Reserve, there are 725 single-family dwellings that vary from 2,500 square feet to more than 6,000. With a clubhouse, fitness center, gated security, lakes, parks, playgrounds, and pool you may never want to leave. Contact Us at Mizner Grande Realty for a private tour of this amazing community.